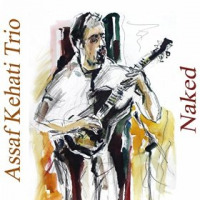 Guitarist Assaf Kehati has never been one to hide behind the impenetrable or the opaque; his art has always been centered on clarity of thought and communicative expressionism, yet he's reached a new level of musical directness and comprehensibility with Naked. On this, his third release, Kehati winnows away anything that could remotely be thought of as excess. There's still plenty to take in, as Kehati paints and peruses well-conceived canvases with his trio mates, but this music isn't about concealment or veiled delivery. Kehati simply speaks his mind through music, and as he does so, truth begets beauty. Naked opens on "Song For Saba," Kehati's heartfelt tribute to his late grandfather, and takes a swinging turn with "Long Ago And Far Away," a number that finds the guitarist coming off like a slightly caffeinated John Abercrombie. Then it's back to unadorned beauty with the title track, off to the Israeli desert for the exciting-but-measured "Beneath The Almond Tree," and on to standard territory for "Someday My Prince Will Come," a performance which avoids coming off as derivative by steering clear of firm waltz time and allowing for some room to breath. As the program continues, the trio finds different ways to communicate. Drummer Ronen Itzik and bassist Ehud Ettun light a flame beneath Kehati, albeit on a fairly low setting, during "The Horses' Fight"; Ornette Coleman's "When Will The Blues Leave" serves as an exercise in mood reorientation, with the trio shifting between chipper, woozy, and upbeat gears; and "Nathan Bo Rega" is somewhat modular in nature, with odd-metered constructs, tempo variations, and a bluesy 4/4 swing send-off. Kehati's brief "Outro"a minute-plus of solo guitar musingofficially closes out the program, leaving thoughts of promise and possibility hovering in the air. It's a concise display that further illustrates the guitarist's uncluttered approach to performance. Track Listing: Song For Saba; Long Ago And Far Away; Naked; Beneath The Almond Tree; Someday My Prince Will Come; The Horses' Fight; When Will The Blues Leave; Nathan Bo Rega; Outro. 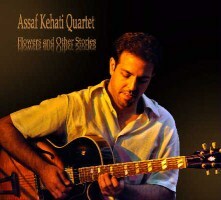 Personnel: Assaf Kehati: guitar; Ehud Ettun: bass; Ronen Itzik: drums.